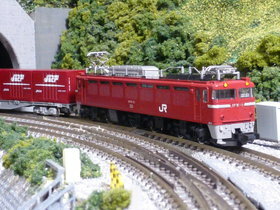 A website about trains and model railways and associated subjects in Japan and other countries. I recently acquired this very fine Tomix E1 Shinkansen, albeit as a 3 car set as part of a trainset pack ("SD Max 90010"). Despite being around 20 years old, the set was in excellent condition - except one of the couplings on the power car was broken, and as it's an integral part of the bogie, not simple to repair. Fortunately Tomix provide replacement bogies (part number 0494), so I hoped it would be a matter of removing the original bogie and installing the new one. Not being sure how the bogies were mounted I decided to strip it down as far as possible. Step 1: remove body - it unclips fairly easily. This turned out not to be necessary, but we see the chassis is covered by a membrane strip (similar to MicroAce units) to protect the motor and electrically inslulate the monobloc chassis. Having got this far, it became apparent that being a monobloc chassis, the bogies are designed to clip in place, and are held in position by the circular plastic "lip" at the top of the bogie tower. They can be removed with a bit of careful twiddling. So far so good, but it turned out the the replacement bogie (lower left in the above picture) is of a subtly different design, presumably for a newer version of the tooling for the Tomix E1, and while it could be coerced into place, it didn't really fit and was clearly not suitable as an as-is replacement. All was not lost, however - a bit of work with some nippers and a pin vise enabled me to bodge the new bogie's coupling attachment onto the old one, which looks ugly but isn't visible when the train is coupled. Via the N Gauge Forum I was pleased to hear about a new website dedicated to "Poole-era" Graham Farish products, Thefarishshed.com. It's still very much work-in-progress but contains some useful background history on the company, which was based in the Dorset town of Poole until its takeover by Bachmann around 2001. While many of the Poole-era models were not the most detailed or reliable, they did represent a major part of the British N gauge market for many years and have a certain appeal for many. As I have an interest in "historical" N gauge models, I have acquired a couple from the Poole era and hope to restore them to working order, and this site should certainly be very useful. Of particular interest to owners of past and more recent Farish models is the section on split gears, which helpfully lists useful sources of parts. Recently I acquired a Lima N-Gauge Class 86, not to run as a serious locomotive but in part out of curiosity about older N-gauge motor mechanisms, and possibly to experimentially modify. It was sold as a non-runner with a missing coupling; the coupling was easy enough to replace with one from Kato, and the non-running was caused by the brush having come loose from the motor (luckily it was still held in place against the motor body by the spring, though I do have some spares). The motor is the ancient pancake type and mounted directly on one bogie, which means there's not much space for it to turn inside the body, which gives it a tendency to derail on tighter curves. The electric pickups are from the non-motorized bogie only, which increases the risk of stalling, particularly across points.